Middletown Country Club and the Agro Golf Corporation are proud to introduce our junior golf program for the summer. This is a great opportunity for a junior golfer to begin or further his/her education and progression in the game of golf. We offer instruction for boys and girls in two different age groups (6-10 and 11-17). The lead instructor is PGA Head Golf Professional Dan Hoban. Dan is a Class A member of the PGA of America and a past member of the Philadelphia Section PGA Growth of the Game Committee and the Junior Golf Committee. Dan has over 25 years of experience in junior golf instruction and is the head golf coach at Philadelphia’s Roman Catholic High School. Dan Hoban was named the Philadelphia Inquirer 2005 Coach of the Year and is a 2007 inductee of the Roman Catholic High School Sports Hall of Fame as well as a 2013 inductee of the 21st Ward Sports Hall of Fame. 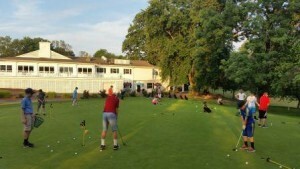 His junior golf programs have produced high school golfers throughout the Philadelphia Catholic, Philadelphia Public, Suburban One, and Catholic Academies leagues. Many of his students played at the collegiate level or are currently now members of college golf teams and two have become PGA professionals-one of which is now competing on the PGA Tour Latin American and Canadian Tour. Our program follows the premise that we learn from the hole backwards because 70 percent of the shots played in an 18-hole round of golf are located within 75 yards of the green. Areas that are covered involve rules, etiquette, safety, putting, short game, full swing lessons with irons, hybrids, fairway woods, driver, and bunker play. To conclude each 6-lesson series, a mini-scramble on the course is played by all students to show that our game is supposed to be fun for all levels!